Hopefully this is just another block in a long line of blocks. Most people call this pattern Churn Dash, but for me it will forever be Hole in the Barn Door since that was the name I seen it called the first time I saw it. The name held the appeal for me. 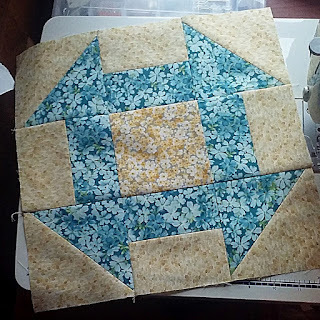 I have made only one quilt using this pattern, but if I ever have one of the 'quilt blocks' made for the side of the garage, this is probably the pattern I would chose. I am not sure what colors though. I really am hoping to make enough of these to make a quilt. Though it and the other block I made have blues, I have not planned on just using blues. What is funny, I am trying to use up scraps. But the local quilt shop has a bin of scraps...and I buy more. To add variety to my scraps! I think I am defeating myself by doing this. If my mom had had all the fabric I have and had had the time, she would never have stopped. Specially when she was my age. When she got up into her late 70's and right before she died in her early 80's...she didn't get as much done. I would love to know how many quilts she made over the years and how many she gave away. I bet it would amaze even me! There are still quilt tops down home that she left that has yet to be quilted, and I think one or two were in the process of being made. I don't know if they will ever get done now. That is a lovely quilt square. I agree with Sandra that we all need something that we love to accomplish. A late friend of mother's crocheted afghans for family and friends, gave them as wedding presents etc. She even made one for mother during her last months. She kept a diary of every afghan she ever gave. There were hundreds! ...fabric among many things can be addictive. Very pretty pattern and the colors and great! Just love blue! I like this pattern too. That is amazing about your mother making so many quilts. I remember sleeping under my grandmother's quilts as a child. She sewed for hours every day into her 70's. A beautiful pattern. My grandmother was much the same. Making quilts and giving them away. I like the blue but other colors would be neat also. You are always busy you know that. Did you finish the quilt for you daughter? I don't know which daughter. I like your block pattern. It is not easy for me to get scrap fabrics here. Maybe I will try looking in some fabric shops in town and hope to find some cheap ones. I love quilt blankets which is very suitable for our hot weather. How many actual quilts of your moms do you have? I LOVE this one, the colors are beautiful! Such pretty blue fabric. Having lots of unfinished quilt tops is par for the course with quilters I'm told!